For patients looking for a permanent solution to missing teeth, the restorative dentistry team at The Paddington Dental Surgery often recommend dental implants. Unlike traditional dentures, dental implants are designed to become a permanent part of your mouth, just like your natural teeth. They do not move or slip along the gums. They are custom-made for the most comfortable fit and require no extra maintenance aside from your normal brushing and flossing routines. At The Paddington Dental Surgery, we are typically able to perform the full dental implant procedure right here at our practice. This revolutionary missing-teeth replacement option has both cosmetic and functional benefits, offering beautiful, natural-looking results that stand the test of time. While these factors all contribute to our happy patients, we are most proud to provide the overall improvement in self-confidence that results from dental implants. From improvements to chewing and speaking to the aesthetic renewal dental implants provide, our patients can’t wait to smile after the procedure. Good candidates for dental implants typically exhibit two main qualities: general good health and proper jawbone density. Patients must not have a medical condition that could interfere with proper healing post-surgery. If one is present, we do offer alternatives to dental implants that can still provide many of the benefits but without the risk of added complications. Once established that a candidate meets the health requirement, jawbone density will be considered. Since the implant is anchored into the jaw, there needs to be enough bone mass to support it and allow it to ultimately fuse with the natural bone. This creates a strong base for the implant so that it can become a natural part of your mouth. dentists will determine whether you are a good candidate for dental implants. If this procedure is not the best option for your needs, we will recommend other options that can help you safely and effectively reach your goals. If you are missing a single tooth, one dental implant often can be placed to restore your smile. Each dental implant is designed to work just like a natural tooth and provide the same degree of beauty and durability. If you are missing multiple teeth, you have a couple of options. You can replace each missing tooth with a dental implant. If several teeth are missing in a row, you can choose to have a denture appliance attached to implants. If you are missing a quadrant of teeth or an entire arch (or both arches), implant dentures can be an excellent way to restore your smile at a typically lower cost than using a full set of dental implants. What should I expect during the dental implants procedure? The process begins with your oral evaluation. Once it’s been determined that dental implants are right for you, we will move forward with the procedure. A detailed map of your mouth will be created as a guide for us to place the implants in the position that will result in the most natural fit and appearance possible. For the next step, our dentist will anchor a strong titanium post that will act as a replacement tooth root. This oral surgery stage of the process can be accomplished using sedation dentistry techniques, if desired, to free you from any anxiety you may have and minimise discomfort. Over the course of three to six months, a process called osseointegration should take place. Osseointegration is the fusing of the implant to the jawbone like a natural root. As this step is underway, a temporary crown will be attached to the top of the implant for a functional and natural-looking tooth. Once the implant has fused to the bone, a permanent crown is attached. This porcelain crown is custom-made for the best fit possible. The crown is colour-matched to provide a natural blend with your surrounding teeth. Upon completion of the finishing touches to your dental implants, you’ll have new, permanent teeth that look so natural, you may have a hard time remembering which ones are the replacement teeth. An alternative to dental implants that we may recommend is a dental bridge. Like dental implants, bridges are designed to replace missing teeth with results that look and feel natural to provide better functionality and an enhanced appearance. However, they differ in that they are not surgically implanted. Dental bridges are traditionally composed of an artificial tooth or teeth to replace missing teeth, supported by two crowns on each side. A dental bridge can be preferable for patients who may not be candidates for dental implants and for those who have several teeth in a row that are missing. These treatments are often better than traditional dentures because there is much less possibility that the bridge will move or slip along the gums. Some patients may qualify for implant supported dental bridges, which can add even greater strength to the bridge and virtually eliminate the risk of damaging or wearing down adjacent teeth. If you learn that you are not a good candidate for dental implants, traditional dental bridges may be a great alternative for you. During your initial consultation, we will discuss all options with you to find the best possible treatment for your needs. Dental implants are designed to last a lifetime, and many people have no need to replace any implants. It’s important to take good care of your restorations to make sure they last as long as you need them to. That means brushing and flossing daily and visiting the dentist regularly. In the rare event that a dental crown chips, cracks, or experiences another type of problem, we can repair or replace the crown. Issues affecting the implants are unlikely, as we take great care when placing them and use the highest-quality materials available. The price of your dental implants procedure will depend on the number of implants you need, the complexity of your treatment plan, whether you will need bone grafting, and other factors unique to you. In general, each dental implant can cost between $1,500 and $4,000. We will discuss the full cost of your program with you at your initial consultation. We believe in cost transparency so that you can make the best health care decision for your lifestyle and budget. We can help you navigate dental insurance claims, find financing options, and more to ensure this process is as straightforward as possible. Dental implants are a great, lasting investment in your smile, self-confidence, and oral comfort. One of the many things that helps The Paddington Dental Surgery stand out among other practices is our ability to perform many types of oral surgery in-house, without the need to refer you to another office for treatment. Our experienced oral surgeon can perform wisdom teeth removal and other teeth extraction procedures, in addition to surgical crown lengthening and other treatments. We can also perform on-site dental implantation for most patients. Our practice is equipped with some of the most advanced diagnostic and treatment dental technology available, including sedation dentistry techniques, to help you achieve safe, effective oral surgery with virtually no discomfort during treatment. Many individuals who have traditional removable dentures find that these appliances can be uncomfortable. Over time, changes in jaw structure can lead to slippage and an imprecise fit that can be painful. A lack of confidence when eating, drinking, or even smiling is sadly common. Dental implants can be a great alternative to traditional dentures. With this approach, permanent tooth replacements can be placed, enhancing comfort, confidence, and hygiene. Unlike dentures, which require greater maintenance, dental implants require the same upkeep as natural teeth. If a full set of dental implants is outside your budget, implant-supported dentures may be a suitable alternative. We are happy to discuss all your options during your initial consultation so that you can choose the best method for your needs and goals. Are you licensed in dentistry? Do you have specific training in placing dental implants? Do you have any dental implant before-and-after photos I could view of your work? You are also welcome, and encouraged, to ask questions specific to your treatment plan. We hope this process gives you additional insight that makes you more confident in selecting an implant dentist. As a service to our patients, our extensively trained dentists have provided answers to some of the most commonly asked questions about dental implants. We hope this resource proves useful to you. If you have additional inquiries, or if you would like to schedule a consultation, please reach out to our friendly team. Dental implants are considered to be the gold-standard solution to replacing missing teeth. That said, it’s vitally important to choose a dentist who is extensively trained in implant placement to preserve the health of your oral structures and to achieve a result that is comfortable and will last the test of time. When choosing someone with the right qualifications, like Dr Duncan Copp, you can feel confident they have your safety and well-being top of mind. Will getting dental implants hurt? Your comfort and safety are our highest priorities. We will numb you to provide as painless an experience as possible, and most people have an easy procedure. 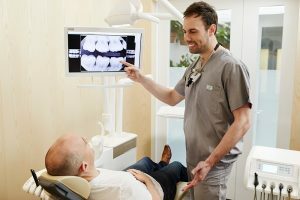 We also offer sedation techniques, which are available for individuals who have a dental phobia or who would prefer to be more relaxed for the procedure. Some tenderness and minor discomfort are normal once the anaesthetic wears off, and most patients find that over-the-counter pain medication is sufficient to address these sensations. Can I eat normally after the procedure? Once the dental implants have healed, you should be able to eat all your favourite foods with confidence. Immediately following the procedure, you will need to follow a soft foods diet for a short period, and you will need to be selective about your food items to allow the implants to effectively bond with bone structure. While some patience is necessarily, the results should be well worth the brief period of limitations. If you have any questions about which foods you can eat and which you should avoid, we will be happy to provide details. Should I choose dental implants, an implant bridge, or traditional dentures? The right restorative option for you will vary depending on a wide range of factors, including your oral health, budget, lifestyle, and other considerations. We will give you the information you need to make the right decision for you. And while we can provide guidance and suggestions, the ultimate choice about how to proceed will be yours. Every dental insurance plan is different. The best way to determine if your provider partially or fully covers the cost of your dental implant treatment is to talk to your insurance agent. We can help you navigate this process, and we also offer financing options if you would like to pay out-of-pocket. We’re here to make your experience as pleasant as possible, so please don’t hesitate to ask any questions about your treatment. Caring for your dental implants is easy—simply treat them the same as you would natural teeth. You should brush twice daily and floss once daily, as well as visit your dentist every six months or as often as they recommend. By maintaining excellent oral hygiene, you are giving your dental implants the security and foundation they need to remain healthy, strong, and functional for life. We can also provide additional care tips at your consultation and at any appointment, as we are just as invested in helping you keep your smile looking its best as you are. For more information or if you’d like to schedule a consultation, please contact us today.